This dataset contains a subset of the suite of indicators (suite 2011) on the level of food security in several countries as provided by FAO. Following the recommendation of experts gathered in the Committee on World Food Security (CFS) Round Table on hunger measurement, hosted at FAO headquarters in September 2011, an initial set of indicators aiming to capture various aspects of food insecurity was selected and called FAO suite of food security indicators. 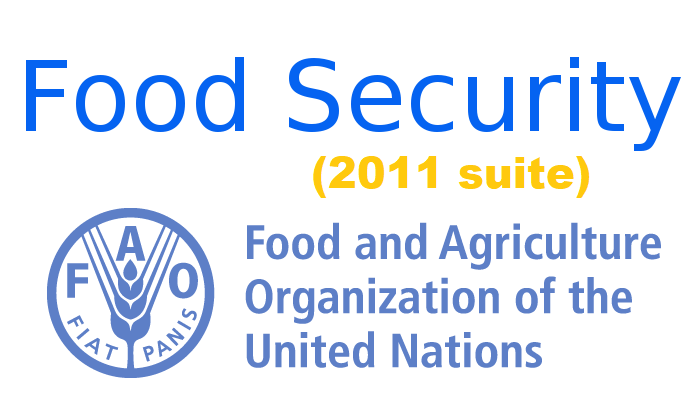 Data from the FAO suite of food security indicators was able to be accessed on FAOSTAT. This indicator is part of the FAO Suite of Food Security Indicators (2011) in the dimension "access". This indicator is part of the FAO Suite of Food Security Indicators (2011) in the dimension "stability". This indicator (originally measured by the World Bank) is part of the FAO Suite of Food Security Indicators (2011) in the dimension "utilization". This indicator (originally measured by the WHO) is part of the FAO Suite of Food Security Indicators (2011) in the dimension "utilization".